More than 400 gather in Williams Memorial Chapel at College of the Ozarks today to show support for survivors, family members, and friends of those lost in last week’s tragedy. Photo by Kevin White. The Ozark Mountain Community came together on Sunday, July 22, 2018, to grieve, heal, and find strength in one another in the aftermath of the tragedy on Table Rock Lake last week. 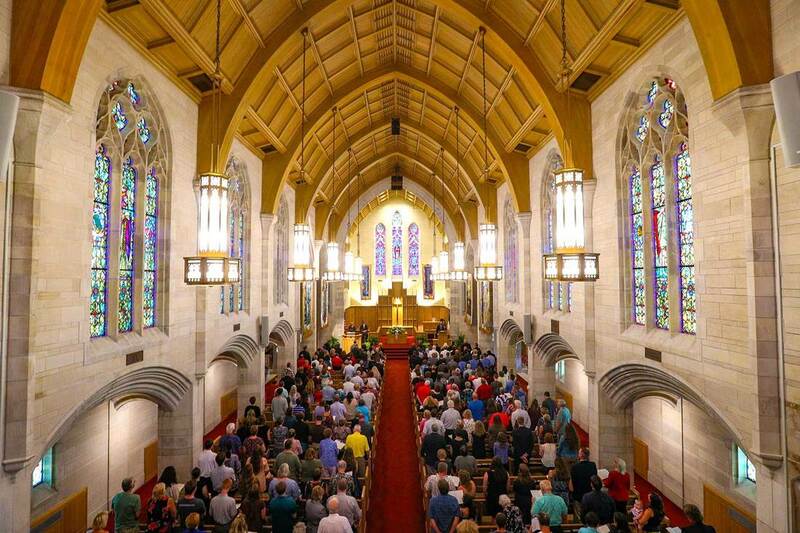 College of the Ozarks, in conjunction with the City of Branson, hosted the memorial service in Williams Memorial Chapel. More than 400 people gathered to memorialize the victims who lost their lives and lift up those who were grieving. Approximately 12 to 15 survivors and friends and family of the victims attended. The service included remarks by Branson Mayor Karen Best and the Rev. Tom Willcox, pastor of First Presbyterian Church in Branson. Justin Carswell, C of O vice president for Christian Ministries and dean of the chapel, brought a message of encouragement for the friends and families of the victims. “As I traveled through our community Thursday evening and over the past few days, what I have seen, heard in conversations, and overheard as I passed by is the sense of shock, grief, and disbelief as a result of the tragic and devastating events,” Carswell said. “In this community, known for its hospitality for all people, it’s difficult to find the words to say. The program also included a Scripture reading of Psalm 23, hymns sung by the congregation, and a benediction by Steve Martin, Nixa Missouri Fire chaplain and pastor of Union Hill Church of Christ in Nixa. The mayor spoke words of encouragement for those impacted by this tragedy.